Earlier this year, I read an article about a new local business that really spoke to me. I had met the owners, Micah and Alicia List, here at Joden on several occasions but I had no idea they had started this cool and trendy business… https://www.neckandtieco.com/shopnt. The Neck and Tie Company moved into the loft at 144.5 South Broad Street at the end of this past summer (right upstairs from us!) and have been going strong ever since. It just so happens that Micah’s ties are the perfect pallet for our vintage tie pins. This is an Art Deco jabot pin made from white gold. 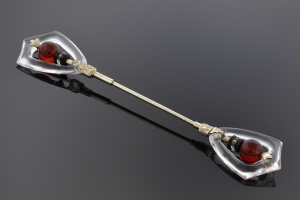 Each decorative end features carved rock crystal quartz, faceted onyx, and carnelian beads. Priced at $3000, it would be a showstopper on any tie. Dragons, and swords, and chains, Oh my! 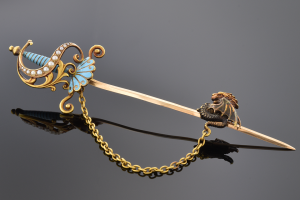 What an exceptional example of Art Nouveau jewelry… the hilt of the sword is decorated with natural seed pearls and light blue enamel while the blade is capped with a intricately carved dragon. Who could resist such an elaborate display of masculine finery? It is available on our website for just $1800 – the perfect stocking stuffer! Be sure to stop in at 144 South Broad Street for your Christmas shopping… visit Micah upstairs for neck ties, bow ties, and pocket squares, then visit us downstairs for the perfect tie pin. 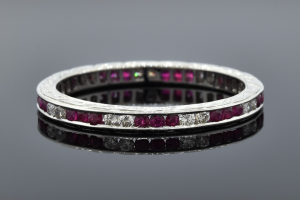 Every girl loves stackable rings… white gold, yellow gold, rose gold, diamonds, and gemstones! Modern, vintage, Art Deco, and Edwardian! You can’t just choose one – choose two or three. Prices starting at just $200.00. The band pictured above is bold enough to wear alone, yet still able to be stacked, if you like. 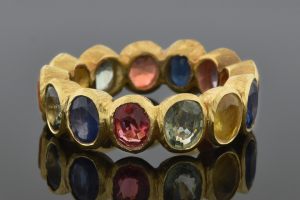 Constructed from 18 karat yellow gold and set with multicolor sapphires, this ring is sure to delight any girl. $1200.00. We just couldn’t resist throwing in a little red and green holiday bling! 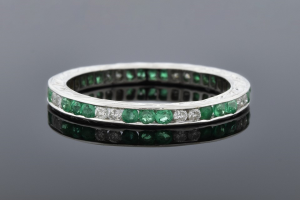 Each of these delicate eternity bands is made from 18 karat white gold; one is set with natural rubies and diamonds and the other is set with natural emeralds and diamonds. Priced at just $1000.00 each. 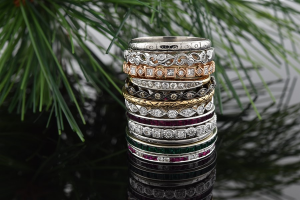 Stop in at Joden Jewelers and put a stack under your tree today! We have been talking about the most popular gifts at Joden for the holidays. 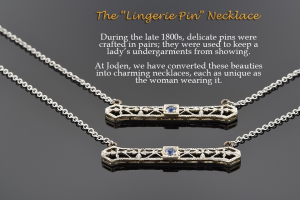 We introduced “Lingerie Pin” necklaces last Christmas and they have been in demand ever since. Originally, these were pins, used to hold your chemise straps inside your dress. Now each one is a lovely necklace that is perfect for every day wear. 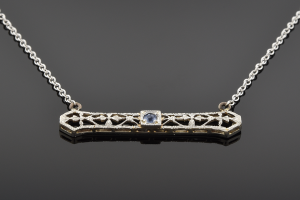 This Art Deco “Lingerie Pin” necklace is made in 14karat white gold, and is set with a tiny sapphire center. Available now for $250.00. For our yellow gold girls, we have this Art Nouveau “Lingerie Pin” necklace. 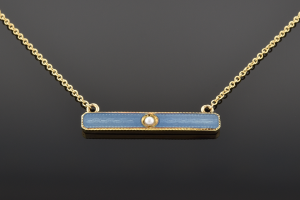 It is made from 14 karat gold, features beautiful blue enameling, and has a seed pearl center. Available now for $250.00. 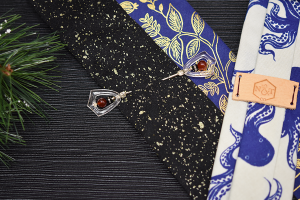 Each of these necklaces is accompanied by a printed card that details the history of the pin and how the necklaces came to be… each one as unique as the woman who wears it.